This allows you to charge safely from any USB socket with no risk of data transfer to/from your device. Simply plug your charging cable into one end, and the other end into a USB socket/charger. 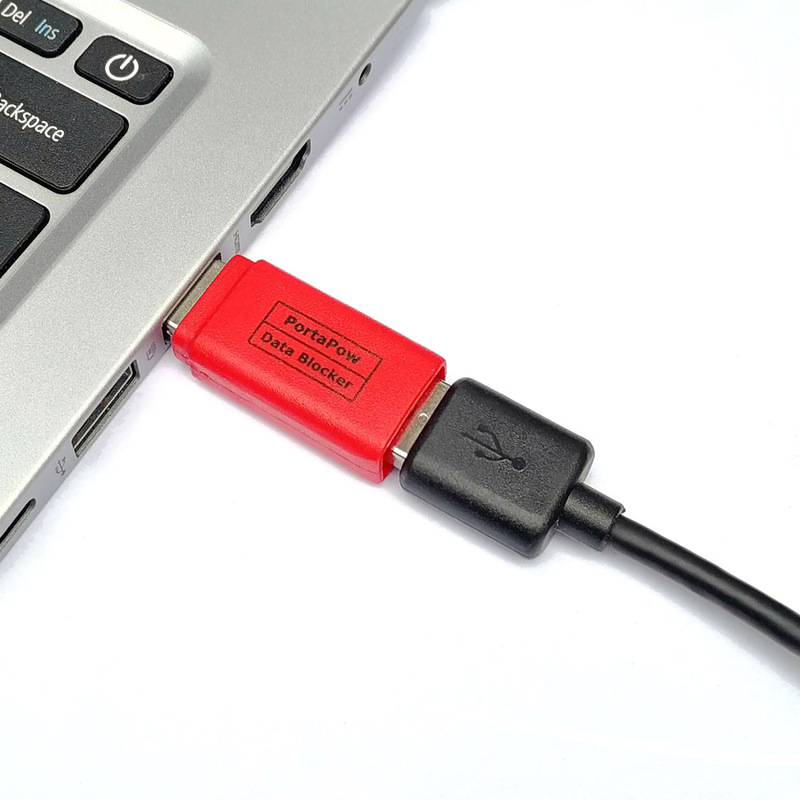 It works on the same principle as our best selling Data Block Cables, but this handy little adaptor allows you to use any good quality cable. It is compatible with smartphones, tablets, mp3 players, bluetooth headphones, and 1000s of other devices. Blocks Data Transfer – your device will not go into ‘data transfer’ mode if connected to a computer, so you can use a computer just like a mains charger. This also prevents data hacking and any risk of viruses being loaded onto your device when charging from an unknown/public USB socket, known as Juice Jacking. It also prevents unwanted syncing/popups, eg when charging from a car’s USB socket. 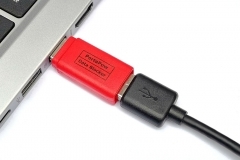 Allows Charging – Many office PCs have their USB sockets disabled for security. This allows charging from those USB sockets without breaking policy. Devices such as some Blackberry or Sony devices will not charge at all from many USB chargers, this enables charging. SmartCharge – Built in chip detects the type of device which is connected and swaps between Apple, Universal and Samsung charging specifications. This prevents the blocker from slowing down charging and can increase charging speed if your charger is sending the wrong signal, eg charging an iPad from a ‘universal’ wall adaptor. 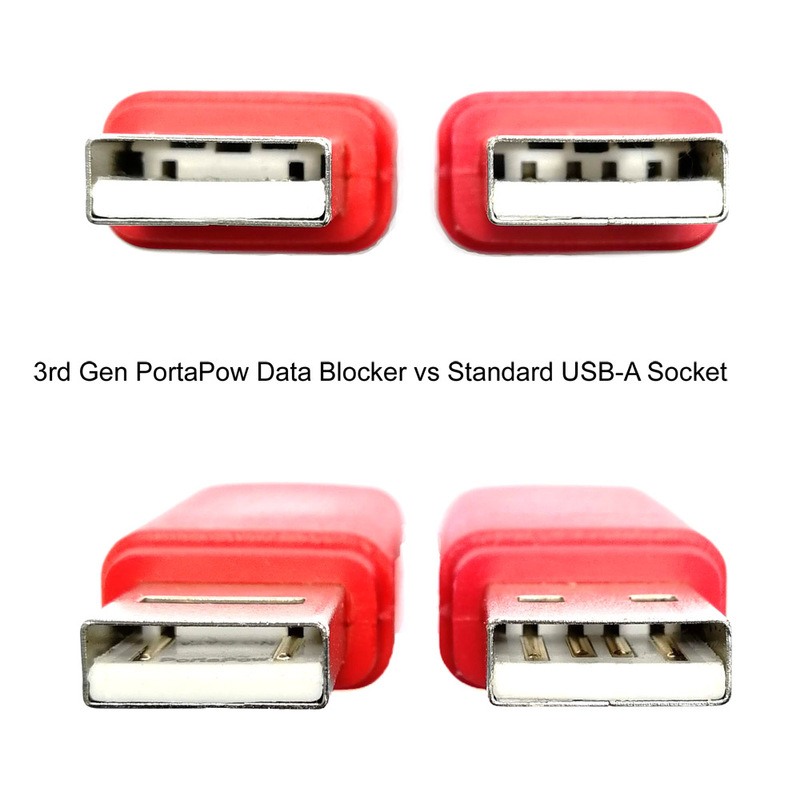 Compact Design – The Data Blocker is barely larger than a normal USB-A connector with a profile of just 18x11mm, so won’t block neighbouring USB sockets. 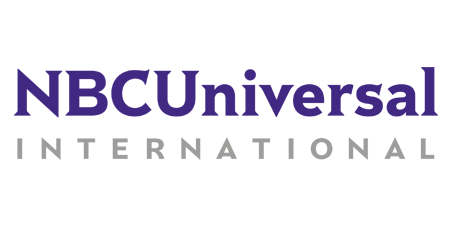 CE Certified – Meets EU standards for safety, radiation and materials. 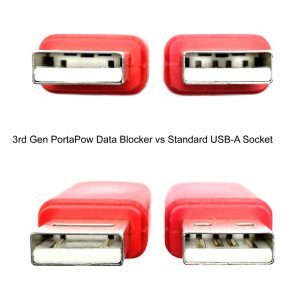 Three Varieties – As well as our most popular USB-A data blocker shown in the photos above, we also offer a USB-C to USB-A adaptor and USB-A to USB-C adaptor, so there’s a data blocker for every combination of charger and cable you’ll find. Limitations – This adaptor is not compatible with extra fast charging technologies such as ‘Qualcomm Quick Charge’ ‘Samsung adaptive fast charge’ as these require data transfer to be enabled. Your device will still power up at a high speed without these. Some satnavs/dashcams use a proprietary signal and will still try to enter sync mode unless their own charger is used. Some car USB sockets do not provide enough power to charge a device, so a dedicated USB car charger must be used. Available from the following Amazon websites: UK, France, Germany, Italy, Spain, USA. Buyers from other countries can choose the international shipping option from the UK or USA websites. We can offer the blocker with your logo/artwork replacing ours for a minimum order of 100pcs. We use the white version of the blocker for orders below 1000pcs, and can print any pantone color. Prices below include worldwide delivery within 4 weeks, a 1 colour print and 20% VAT will be added for UK customers. Each additional colour is £45 / $60 extra, or we can offer a £140 discount without custom artwork. 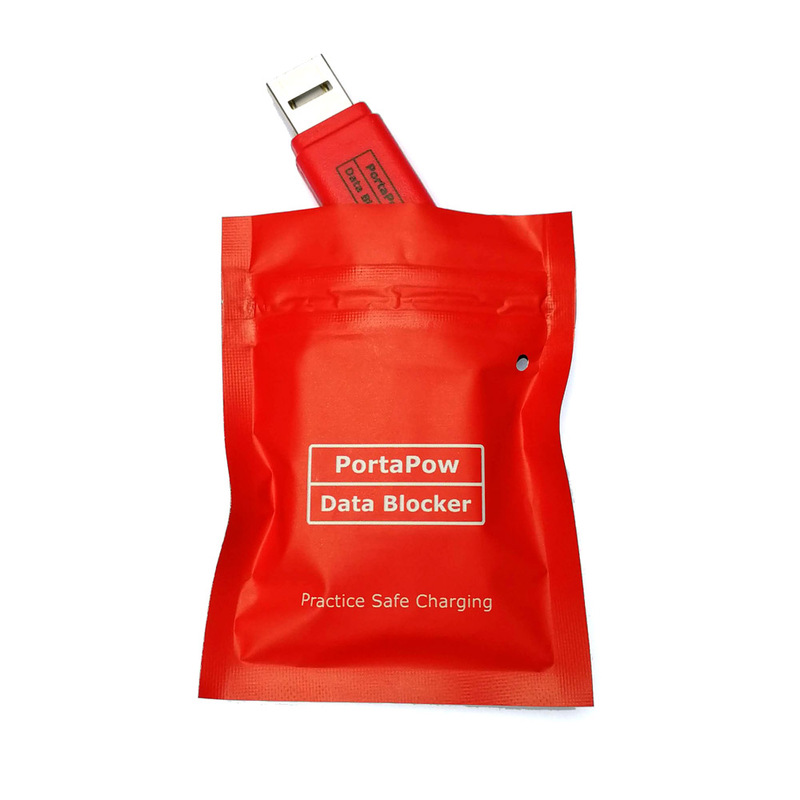 Contact us at info@portablepowersupplies.co.uk for further details. 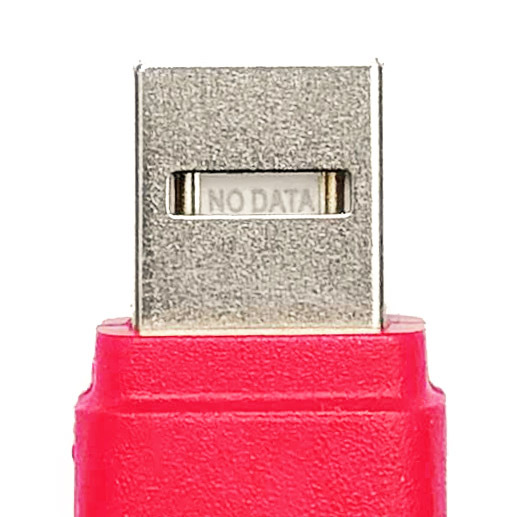 Visible Security – The two data wires have been physically removed from the USB-A connector leaving only the two power wires. So you can easily see there is no chance of data transfer. 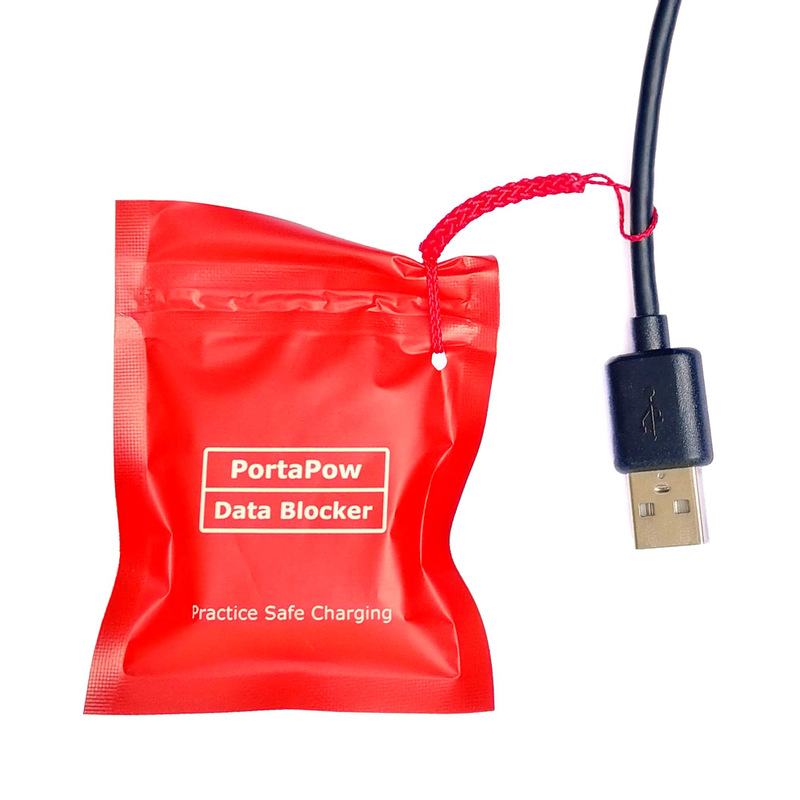 Added Authentication – ‘NO DATA’ and ‘PortaPow’ have been laser etched into the connector so you can be sure its a genuine blocker. An inspection window has been cut to see at a glance that the wires for data transfer have been removed. Reusable Packaging – The bag the adaptor arrives in can be reused as a case for the blocker and/or other small parts such as a USB-C to Lightning adaptor or a Lightning to headphone adaptor. The internal size is 60x50mm. String Lasso – The bag can be attached to a USB cable or keyring so the data blocker and / or other bits such as a USB-C to headphone adaptor or Lightning to USB-C converter are always at hand. Instructions for attaching the lasso are here.